With Earth’s population growing at an exponential rate, the future of agriculture — in particular precision agriculture — will continue to grow in importance as the world works to support its population. Satellite monitoring, a key component of precision ag, aids in the analysis of everything from crop type and crop health, to yield prediction. And as the global agricultural stakes are raised as the population balloons, so too does the need for increased access to extremely high quality imagery, on a reliable and frequent basis. The ability of farmers to gain actionable insights is absolutely contingent on the use of high quality imagery, which can provide accurate measurements of what is happening in the field, with less noise and higher sensitivity. With that in mind, UrtheCast attended the industry-leading InfoAg Conference in St. Louis, Missouri. We showcased not only our current four-sensor system — including Deimos-1, specifically built for precision ag — but also the UrtheDaily™ Constellation, a planned revolutionary eight-satellite constellation designed to image the entire planet’s landmass (excluding Antarctica) every day, at 10:30 am local time. UrtheCast’s sensor system is one of the most diverse in the Earth Observation business, and with that brings a host of benefits, including heightened analysis for precision agriculture. The entire UrtheCast sensor system provides high-quality imagery, like that captured from Deimos-1 and Theia, composed of rich multispectral data with uncompromisingly high radiometric and geometric quality. With frequent coverage of continent-wide areas or the monitoring of a single field, UrtheCast can design the perfect imagery solutions for many applications, thanks to our sensor system variety. The system can provide frequent revisits over AOIs, broad coverage (from our three sensors and nine other sensors in the PanGeo Alliance), and planned daily global revisit in the future with UrtheDaily. Data via API using the UrthePlatform or via rapid FTP delivery from our Customer Experience team. High-quality data at flexible and competitive pricing structures brings higher value. 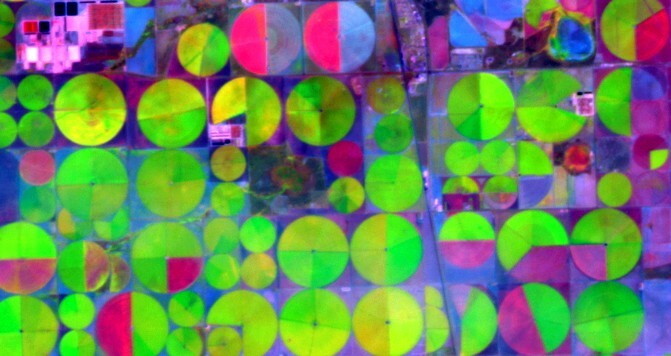 A team with over a decade of experience and unique expertise in supporting agriculture applications with multi-satellite imagery services, while Deimos-1 and UrtheDaily are designed specifically for Precision Agriculture. Texas, USA, captured by UrtheCast’s Deimos-1 satellite. Classifying every crop type across the U.S. The Deimos-1 satellite is a workhorse in the agricultural monitoring world. Since 2011, Deimos-1 has been on an agricultural mission for the U.S. Department of Agriculture (USDA), which has used Deimos-1 (and its twin UK-DMC2) as its main satellite imagery source to monitor and classify more than 100 crop types every day across the U.S.
As a part of the program, the USDA is provided with complete coverage of the contiguous U.S. every 15 days during the growing season (April to October), more than 90% cloud-free and with daily acquisitions. Every day, for six months out of each year, more than 1-million km2 of cloud-free data is delivered and orthorectified with <1 pixel GSD accuracy, which allows for high-quality multi-temporal analyses. Most of this data is delivered in less than 24 hours from acquisition. What’s more, as of April 2016, that Deimos-1 data of the entire contiguous U.S. is being made available throughout the growing season on our highly-accessible, cloud-based UrthePlatform; another step towards the democratization of Earth Observation data. For four years, Deimos-1 has been providing a high-frequency monitoring service in selected crop fields throughout the U.S. In cooperation with UK-DMC2, Deimos-1 is relied upon to deliver one image every two days, less than 24 hours following acquisition — complete with dedicated processing and quality control. All data is orthorectified with <1 pixel GSD accuracy, allowing for high-quality multi-temporal analyses. This frequency of fresh imagery allows for the management of crop field irrigation with unprecedented precision. The status of every 20×20-m area is assessed every two days and irrigation can be commanded with incredible precision, resulting in huge water savings and a large increase in crop yields. This near-daily monitoring allows for the early detection of crop illnesses, enabling the farmer to take quick action to minimize crop damage. Cultivations in Saudi Arabia, captured by UrtheCast’s Deimos-1 satellite. By supplementing weather information with daily updated imagery, leading solution providers leverage Deimos-1 imagery to analyze crop conditions throughout the world. Farmers across the world use this analysis to make better decisions about supply conditions and risks. Using dedicated processing and quality control, all Deimos data is orthorectified with <1 pixel GSD accuracy, allowing for high-quality multi-temporal analyses. Because timeliness and accessibility are key, all data is delivered in less than 24 hours following acquisition. Deimos-1 imagery is used worldwide to determine crop and vegetation conditions, anticipate crop loss, and assess crop damage insurance claims. The full compatibility of Deimos-1 data with historical Landsat data allows for the comparison of past and current vegetation conditions. Idaho, USA, captured by Theia. From aboard the International Space Station, Theia captures strips of imagery at a pixel size of 5 meters. This four-band multispectral imagery (B, G, R, NIR) has a swath of approximately 50 km and continuously flows into the UrthePlatform soon after acquisition, making it particularly accessible. UrtheDaily is a planned eight-satellite constellation designed to acquire uncompromisingly high-quality multispectral imagery, at 5-m resolution, of the entire Earth’s landmass everyday at 10:30 am local time. The system has been optimized for agricultural and change-detection applications — for planned delivery of high-frequency, high-quality data that enables geoanalytics capabilities that the agriculture industry has yet to see. Being built for efficiency, this constellation of eight satellites is designed to be precisely cross-calibrated and will have a long lifespan, making it a dependable, high-fidelity, long-term solution for the industry. To provide the maximum coverage, the entire world’s landmass can be acquired daily, without any gap. That’s 140 million km2 of multispectral imagery every 24 hours. At 5 m per pixel, this high-quality imagery is designed to generate rich multispectral data with a high radiometric and geometric quality. With an eye toward speed, these new daily datasets are being built to be delivered within 12 hours following acquisition. Also planned, and working in sync with UrtheDaily, will be the world’s first fully-integrated constellation of Optical and Synthetic Aperture Radar (SAR) satellites. OptiSAR, which UrtheCast is currently developing, will provide the ability to image cloud-free on any given day or night, bringing additional value to the agricultural community. Kansas, USA, captured by UrtheCast’s Deimos-2 satellite. When anomalies are detected by Deimos-1, Deimos-2 can provide high-res imagery for closer analysis. With a higher spatial resolution, Deimos-2 imagery is used to precisely outline the affected area(s) and accurately determine the spatial variability. Deimos-2 also contributes to the surveillance and monitoring of the implementation of the CAP (Common Agriculture Policy, in the European Union), by monitoring the conservation of natural pasture, fallow land, field margins, hedges, trees, and buffer strips, etc. Deimos-2 is a very high-resolution Earth Observation satellite capable of providing 75-cm pan-sharpened, 1-m pan and 4-m multispectral images with a 12-km-wide swath. Not only is Deimos-2 imagery a powerful data source, it is also an affordable one. Tasks that can be achieved with Deimos-2 data include defining management zones, planning soil samples, defining maps for variable rate of seeding and fertilizer, prescriptions for variable rates: fertilizer and plant protection products (pesticides, herbicides, etc. ), supporting irrigation management and watering systems. With eight members and a growing fleet of Earth Observation sensors, the PanGeo Alliance provides access to complementary imagery and tasking opportunities for ongoing or special projects. The PanGeo fleet includes 13 operational Earth Observation imaging sensors, providing multispectral imagery in a wide range of resolutions (from 20 m to 75 cm per pixel). This unique fleet assures a daily global imaging capability, with multiple revisits per day over any target. As members of the PanGeo Alliance, UrtheCast and Deimos Imaging will work with customers to provide custom and complementary data services to fulfill project requirements. This blog post contains certain information which, as presented, constitutes “forward-looking information” or “forward-oriented financial information” within the meaning of applicable Canadian securities laws. Forward-looking information involves statements that relate to future events and often addresses expected future business and financial performance, containing words such as “anticipate”, “believe”, “plan”, and “expect”, statements that an action or event “may”, “might”, “could” or “will” be taken or occur, or other similar expressions and includes, but is not limited to: its plans for and timing of expansion of its product offering and value-added services; its future growth and operations plans; the acceptance by its customers and the marketplace of new satellite imaging content, technologies and solutions; and the design, build, completion and operation of the proposed OptiSAR and UrtheDaily constellations. Such statements reflect UrtheCast’s current views with respect to future events and are necessarily based upon a number of estimates and assumptions that, while considered reasonable by UrtheCast, are inherently subject to significant uncertainties and contingencies. Many factors could cause UrtheCast’s actual results, performance or achievements to be materially different from any future results, performance, or achievements that may be expressed or implied by such forward-looking statements, including, among others, any impediments in the operation of UrtheCast’s HRC or MRC sensors or the Deimos-1 or Deimos-2 satellites, any delays or failures in its ability to finance, design, develop, construct, launch and commission the proposed OptiSAR or UrtheDaily constellations, as well as those factors and assumptions discussed in UrtheCast’s annual information form dated March 29, 2016, (the “AIF”), which is available under UrtheCast’s SEDAR profile at www.sedar.com. Forward-looking information is developed based on assumptions about such risks, uncertainties and other factors set out herein, in the AIF, and as disclosed from time to time on UrtheCast’s SEDAR profile. UrtheCast undertakes no obligation to update forward-looking statements except as required by Canadian securities laws. Readers are cautioned against attributing undue certainty to forward-looking statements.